Former trade and investment minister Andrew Robb addresses the 2017 Northern Territory Cattlemen’s Association conference in Darwin. For 170 years Australia’s primary markets were 12,000 miles away in Europe and US. Now, thanks to the “economic miracle” that has unfolded in Asia over the past 30 years, eight of our 10 biggest markets lie within our region and same time zone. 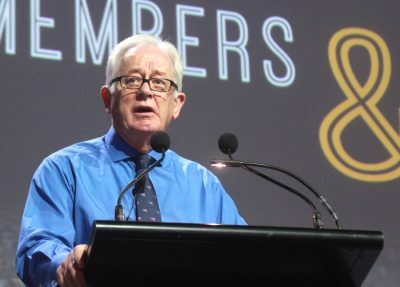 That gives Australian exporters an enormous advantage, former trade minister Andrew Robb told Friday’s NT Cattlemen’s Association conference in Darwin. 70 percent of world growth is being driven in our regional backyard, and 40pc in China alone. The Asian region will continue to drive most of the world’s growth for the next century. 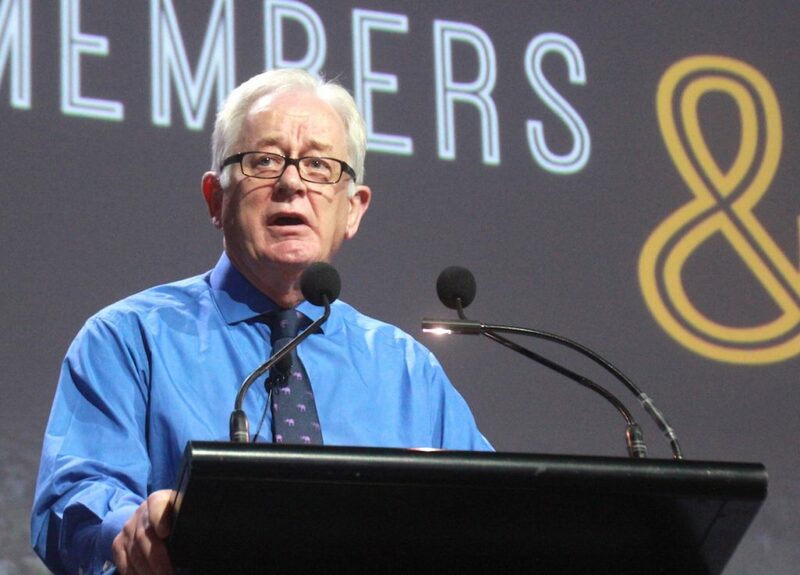 Few people can offer the depth of insight into current global trade dynamics and opportunities as Andrew Robb. The former executive director of the Cattle Council of Australia and National Farmers Federation and business consultant spent three years as Australia’s Minister for Trade and Investment to 2016. During this time he negotiated trade agreements with South Korea, Japan and China, Singapore and the 12 Trans Pacific Partnership (TPP) nations, and conducted 85 investment roundtables with 28 countries. “The next few decades can absolutely be extraordinary,” Mr Robb said in his keynote address to an audience of 400 cattle producers and beef industry stakeholders in Darwin. The trends were already evident, he said. In 2013 Australian food exports were a poor cousin to iron ore, totaling $27 billion, compared to $60 billion. Last year iron ore exports were still worth $60b, but food exports had grown by 60 percent to $44 billion. The opportunity was much wider than China alone. In 2000, four million people were in Indonesia’s middle class. By 2016, 50 million people were in Indonesia’s middle class. Within 15 years, Indonesia will be the fourth biggest economy in the world. Indonesia is just next door, yet Australia has more companies in Dubai than Indonesia. “If it wasn’t for the live cattle trade, Australia would have almost no connection with Indonesia”. In India, 30 people every minute of every day of every week move from regional areas to cities. That’s 43,000 people every day in India moving from rural to urban areas. This trend will continue for 20 years, amounting to 320 million people. “That is 32 cities times 10 million people. They have started to build those 32 million cities.” Again Australia has less companies in India than it does in Dubai. On China, we tend to have a view in Australia that we are significantly penetrating the market. We are making some inroads through online channels such as JD.Com and Alibaba. But how about the one million supermarket outlets in China? Not long ago Mr Robb asked the owner of a supermarket with 220,000 outlets how much Australian product was on his shelves. The answer was zero. Mr Robb stressed that two-way trade and investment from Australia is needed to build trade relationships in the region and, in turn, demand. “For a long time we thought we couldn’t influence demand, but I am telling you, my observation is that we can and we must,” Mr Robb said. “It requires developing deep relationships, friendships, linkages, understanding cultural differences, appreciating different ways of doing business, and mutual respect. He said joint venture partnerships, where all involved had skin in the game, represented an effective way to develop relationships and mutual trust. Mr Robb urged co-investment in the supply chain where “you share the risks and share the profits, and you build the understandings and you then cater very much to what the market wants because you will have that connection”. What do BMWs and Aussie beef have in common? Australia’s clean, green, healthy image provided a massive brand advantage in the region, a ‘gold standard’ that had to be protected. Australia had to focus on premium markets to capture the higher margins needed to cover our higher cost of production. However, this did not mean that Australian product should be restricted only to the high-end markets. He offered BMW as an example. “BMW created a brand as being alongside Mercedes, the car of enormous quality, it is a clean, green healthy equivalent if you like, but at a premium end of the market. “But once having established that brand, it doesn’t matter what part of the car market you go into. “In the $30,000 range they have a BMW. “But people think that that BMW in the $30,000 range is superior to the other models, because that is the their brand and their brand strength. “And I tell you, once you establish a brand – it is hard to establish it and it is hard to change it. The re-emergence of China and India and how they share global power with the US will create opportunities and challenges for Australia. Mr Robb likened the changing dynamic to bulls in a paddock, with young and old challengers watching each other closely. Agriculture, through its communications with politicians and its strong relationships throughout the region, had a part to play in ensuring common sense prevails. In 2011 Australia saw prosperity turned on its head through “a crass and mis-informed political action” by a government in response to an aggressive, orchestrated social media campaign to ban live exports. “There is a lot of tensions and misrepresentations and potential for misunderstandings and we are going to be caught as meat in the sandwich,” Mr Robb said. “These things that are happening in the region are important to us, and your point of view to our politicians is very important throughout this process.